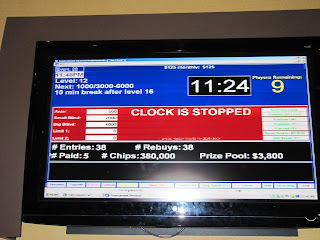 (Above) They stopped the clock when we negotiated the chop of the prize money. I went back to the Gold Strike Saturday night for the 7 p.m. tournament. The buy-in was the same as Friday -- $135 which included a $10 tip for the dealers. Only 38 runners showed up. This tournament used to routinely have 80 to 100 players. Maybe the attendance is down because of the WSOP at Harrah's which just concluded. When we got down to 8 players, one guy wanted to chop (split the prize money). He lives around here and was anxious to get home. He said the text messages from his wife were getting "more belligerent." We gave the big stack a little extra and split the rest $414 for each. When we chopped, the blinds were 2000/4000/500. I had 40K in chips which was almost average. With eight players, it cost 10,000 for one orbit. In other words my M was 4! That's typical of these tournaments. It becomes a shove-fest, and that's why players are so eager to chop. It's disheartening to play five or more hours and bubble out and get nothing. Here's my favorite hand: When the blinds were 100/200, there were three limpers to the small blind who raised it to $1200. I had ♥10 ♦10 and plenty of chips. What would you do? Some say you should raise or fold, but here's a good example of why there are exceptions to that. I had position and was happy to just call. The limpers folded, as I knew they would. The flop was ♦A ♠9 ♣4. Instead of watching the flop, I was watching the villain and he had a disappointed body language and checked. I fired a bet of 3000. "Every time a f---ing ace comes!" he said as he showed ♣K ♥K and mucked. There really is something to keeping a poker face. I was all in for my tournament life one time. That was at the final table when I had 6-6 and the villain had A-K. The board bricked out and my pocket pair held. Also, at the final table, the guy on my left wasn't a very experienced tournament player. Twice it folded around to me and I managed to steal the pot with nothing. Once he called (I had 9-3). There was a king on the flop and I fired another bet and he called! I checked the turn, as did he, and the river was a 3, giving me a pair. We both checked and I announced I had a pair. He mucked after I showed. The Gold Strike is a hotel as well as a gaming area. 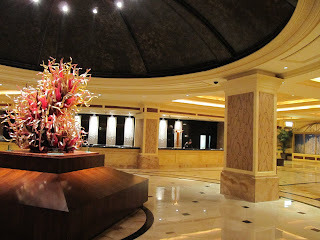 Shown above is the lobby. The Gold Strike has a buffet and several places to eat. 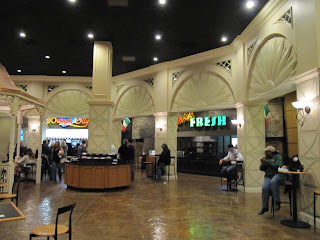 Above is part of The Food Court. Images by MOJO and taken with my P&S. My admiration for you is growing. You succeed at money levels far higher than I am willing or able to play. Do you play many cash games? If you do, is that different for you or not, in terms of the $ levels you can compete at? "I was watching the villain and he had a disappointed body language and checked. I fired a bet of 3000." Good read and nice cash! When are you quitting your day job? Congrats again MoJo.. Is the year of the MoJo.. You GO!!!! I don't play tournaments - I liked Sit'n'Go's online, as they went quickly. But I don't like this chopping business - you made some money, but could've made more. I think tournaments should be played out. Nice, mojo! I think chopping is the norm in Tunica. It's rare for them to be played til the end.